6 Berkshire Boulevard, Suite 306, Bethel, CT 06801. 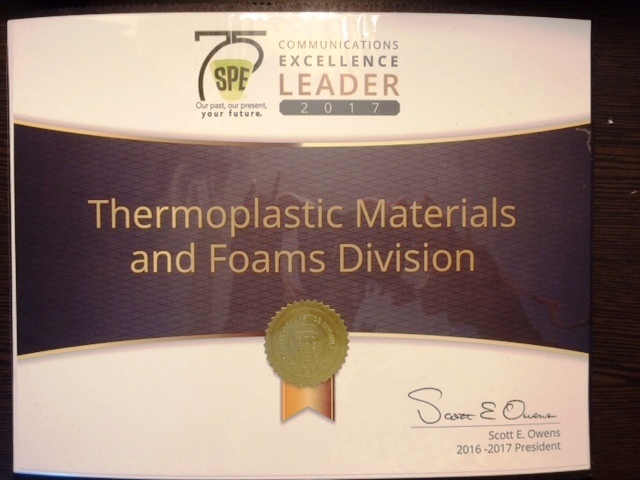 We are pleased to announce that Pavani Cherukupally and Ali Anwer are the recipients of the first annual Ananda Chatterjee travel awards given by the Thermoplastic Materials and Foams (TPM&F) Division. Pavani and Ali will each receive $500 to offset travel expenses to the ANTEC Conference, where they will present papers and posters highlighting their research. We would also like to acknowledge Nihal Kanbargi and Alireza Tabatabaei with Honorable Mentions. All four of these outstanding students will be recognized at the TPM&F Business Meeting and Reception at ANTEC 2017. Pavani Cherukupally was selected as a travel award winner because of her research contributions, academic achievements, and leadership experience. Pavani will be presenting two papers and a poster at ANTEC, highlighting her novel application of foams to remove pollutants from industrial waste water. She has achieved a GPA of 3.9 during her graduate studies. In addition, Pavani has shown consistent leadership, which includes initiating collaboration among experts from the University of Toronto, Cornell University and Leibniz Institute of Polymer Research and also training 5 graduate and 10 undergraduate research students. 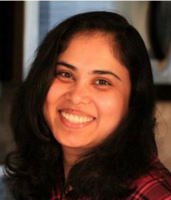 Pavani has also served as Chief Returning Officer of Graduate Student Union, Marketing Lead of Engineers without Borders, and Chair of Consortium of Microcellular Plastic and Manufacturing. Her volunteer work on campus has been recognized with a Contributing Member of Student Life award. Ali Anwar was selected as a travel award winner because of his broad range of research contributions and awards, his academic excellence, and his industrial experience, which includes designing composite curb side gully covers to replace ineffective cast iron ones. Ali's university research includes the development of new elastomeric composite material for slip resistant footwear, composite manufacturing method development, and development of advance thermoplastic composites using 3D printing. Ali's research has been recognized with a series of honors and awards, including multiple NSERC scholarships and grants, an SPE travel award that enabled him to present an ANTEC 2016, and also a University of Toronto conference travel award. Ali has conducted his research in collaborations with peers, and he has supervised the research of 6 undergraduate and 3 MEng students. In addition to these candidates' credentials and accomplishments, the judges were extremely impressed with the reasons that they expressed for attending the conference. All four of these students, Pavani, Ali, Nahil, and Alireza, conveyed genuine enthusiasm for sharing their research results with the scientific community. They specifically said that they hoped to make contributions to the field through their research findings, and they also said that they hoped to enrich their research projects based on dialogue with other experts. We thank all of the applicants and their mentors. We wish all of these exceptionally talented students continued success, and we look forward to hearing their presentation and to discussing their research. 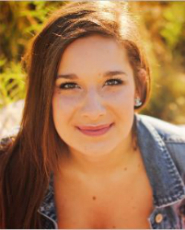 The 2016 year winner of the Thermoplastic Materials and Foams Scholarship award is Ms. Josey Hrbek. Thirteen candidates applied for the scholarship this year, and in the four judges’ opinions, Ms. Hrbek emerged as the clear winner. her outstanding 3.83 GPA which has earned her a variety of Alpha Gamma Delta awards and Kettering University Dean’s lists. This is not to mention her broad employment background in paints (PPG), plasma cell technology (Kettering University (KU)), composites (KU), fiber coatings (KU), piping and instrumentation diagrams with AutoCAD (Emergent Biosolutions), and catalytic converting (Umicore Autocat). Josey displays a positive can-do spirit combined with strong initiative, drive, and communication skills which will make her an excellent chemical engineer in the future. We wish her continued success. 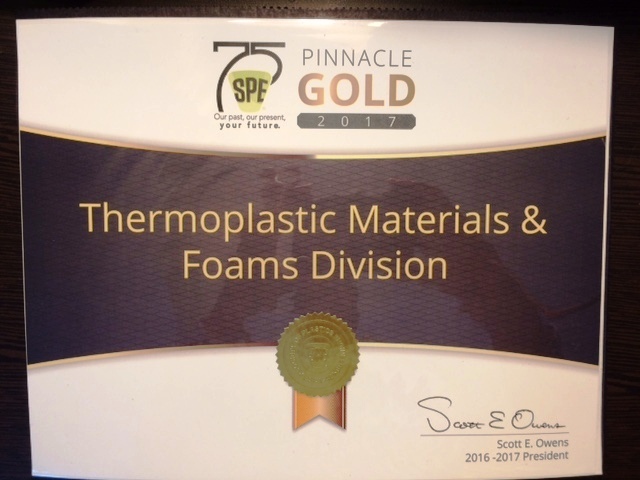 The Thermoplastic Materials and Foams Division will continue to offer this scholarship to worthy candidates in the future with the theme of thermoplastic and foam backgrounds. So if you believe that you know of other deserving candidates, please apply in 2017. Mr. Abhishek Gandhi was awarded a sum of $500. Abhishek Gandhi is a Ph.D. research scholar at Indian Institute of Technology, Delhi working in the field of polymer foams for the last five years. 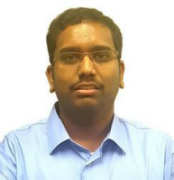 Abhishek's research work is on development of microcellular porous foamed sheets. Mr. Anindya Dutta was awarded a sum of $500. 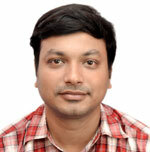 Anindya is a New Delhi postgraduate Ph.D candidate for foams related topic and a foams conference attendee.